There are natural processes in the Earth system that remove anthropogenic carbon dioxide from the atmosphere, helping to limit climate change. These processes in natural biogeochemical cycles and feedbacks may change in a warmer climate, thereby amplifying climate change. How the carbon cycle and feedbacks will change is very uncertain. In a new Grand Challenge project "Carbon feedbacks in the climate system" approved by the World Climate Research Programme (WCRP), the participating researchers from all over the world will investigate how these biogeochemical cycles and feedbacks control carbon dioxide concentrations and impacts on the climate system. What are the drivers of land and ocean carbon sinks? What is the potential for amplification of climate change over the 21st century via climate-carbon cycle feedbacks? How do greenhouse gases fluxes from highly vulnerable carbon reservoirs respond to changing climate (including climate extremes and abrupt changes)? Tatiana Ilyina: "Our grand challenge is to reduce uncertainties in quantification of the carbon feedbacks in the climate system. We aim at addressing some very specific questions, such as: What is the role of the Southern Ocean in controlling the strength and variations of the ocean carbon sinks? Or, how do processes of CO2 fertilization and nutrient limitation affect the efficiency of the land carbon sink?" The land and ocean biogeochemical cycles are key components of the Earth´s climate system. The fluxes of many greenhouse gases and aerosol precursors are controlled by biogeochemical and physical processes. They are sensitive to changes in climate and atmospheric composition. Most importantly, biogeochemical processes control atmospheric concentrations of the main greenhouse gases (carbon dioxide (CO2), methane (CH4) and nitrogen oxide (N2O)). Plants, soils and permafrost together contain at least five times as much carbon as the atmosphere. The global ocean contains at least fifty times more carbon than the atmosphere. Based on the 2015 Global Carbon Budget estimates, since 1870, CO2 emissions from fossil fuel combustion have released about 400+20 Gigatonnes carbon (GtC) to the atmosphere; land use change is estimated to have released an additional 145±50 GtC. Of these cumulative anthropogenic CO2 emissions, 230±5 GtC have accumulated in the atmosphere. The ocean and the land ecosystems have taken up 155±20 GtC and 160±60 GtC, respectively. Land and oceans are hence absorbing around half of the carbon emitted from human activity, significantly mitigating the buildup of CO2 in the atmosphere and climate change. In the absence of these carbon sinks, current atmospheric CO2 would already be about twice the pre-industrial CO2 concentration, with an associated global warming likely above 2°C. However, substantial uncertainty remains about the magnitude of these carbon sinks and how they currently operate. Furthermore it is not well known whether they will continue to be as effective under climate change. When climate models first included climate-carbon cycle feedbacks, they indicated the potential for these carbon sinks to be significantly weakened under global warming, accelerating atmospheric CO2 increases and hence global warming over the 21st century. The inter-comparison of first-generation coupled climate-carbon cycle models (C4MIP) showed carbon cycle feedbacks to be a key uncertainty in climate projections, of similar importance as uncertainty arising from physical feedbacks. The CMIP5 Earth system model simulations assessed in the Assessment Report 5 of the Intergovernmental Panel on Climate Change (IPCC) still showed significant uncertainty, particularly for the land components. For the land carbon sink, large uncertainties remain about future fluxes from tropical ecosystems, about the possible fluxes of CO2 and CH4 from thawing permafrost and wetlands, and about the current and future role of nutrients as growth-limiting factors. As for the ocean carbon sink, the Southern Ocean is the key player in global uptake of anthropogenic carbon. Yet the strength of this important ocean sink and its response to climate change and variability are still poorly assessed and represented in ESMs. Limitations in the understanding of the carbon sinks have crucial implications for climate policy, such as the estimate of the remaining CO2 emissions compatible with a global warming target of 2°C (or 1,5°C as proposed at the Conference of the Parties (COP) 21 in Paris). Fig. : Overview of biogeochemical processes and feedbacks in the Earth system. Growing fossil fuel carbon emissions increase atmospheric CO2 concentration, thereby affecting the physical climate system (red arrows). Ocean and land biogeochemical processes and exchange of carbon with the atmosphere are directly affected by the state of the physical climate system (brown arrows) and CO2 concentration via dissolution of CO2 in the ocean and CO2 fertilization of terrestrial vegetation (black arrows). 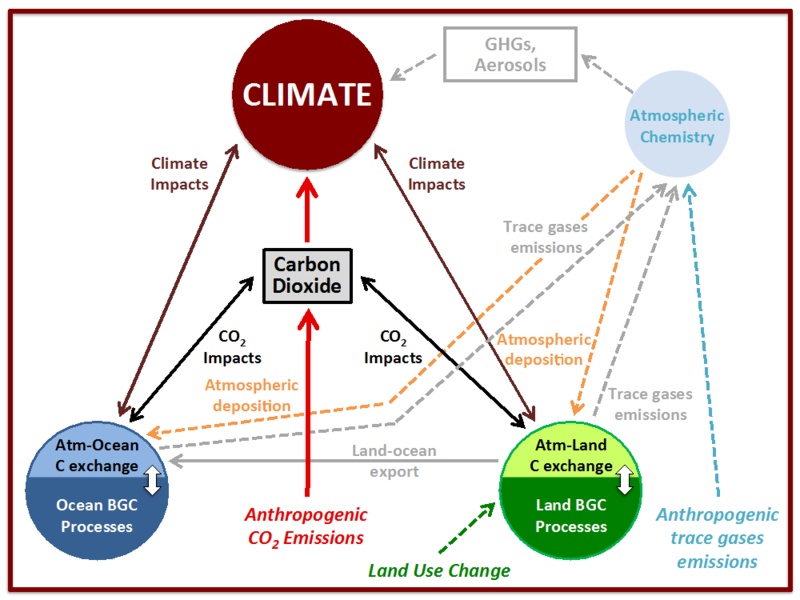 In return, ocean and land affect climate and atmospheric CO2 via biophysical and biogeochemical feedbacks, respectively (same brown and black arrows). Additionally, land and ocean pools of carbon and nutrients are affected by their transport from land into the ocean (grey arrow). Land and ocean biogeochemical processes are affected by atmospheric deposition (orange dashed arrows); they affect atmospheric chemistry via emissions of trace gases (grey dashed arrows) and thus further impact on the physical climate state. The Grand Challenge project will over the next 5-10 years address the three key guiding questions with four research initiatives. The kick-off-meeting will take place in Hamburg from 21-22 November 2016. A Carbon Feedbacks Grand Challenge Steering Committee (SC) comprised of about ten members who are worldwide leaders in the field will oversee the implementation and progress of the initiatives listed above, and will define clear objectives and work plans. The SC will associate each research initiative with key individuals, who will serve as leaders. In workshops small groups of leading experts will strengthen the links between the guiding questions and the research initiatives as well as emphasize major gaps. Results of the workshops will be summarized in papers in high-profile journals. There are activities across the world that contribute to the four research initiatives, as the Coupled Model Intercomparison Project (CMIP) and the contribution to the IPCC assessment reports. The CMIP6 project will coordinate several MIPs that are relevant for the Carbon Feedbacks Grand Challenge, in particular the historical simulations of the land and ocean carbon uptake capacity. Beside modelling activities, growing observational networks and products will prove essential for process understanding and deliver, for example, ocean CO2 observations, sea surface salinity, and vegetation cover. Model development and evaluation remain central to this Carbon Feedbacks Grand Challenge. The EU project CRESCENDO focuses on improvement and comprehensive evaluation of terrestrial and marine components of Earth system models. The Earth system models (will) include a more comprehensive representation of the nitrogen cycle both on land and in the ocean as well as representations of permafrost and wetland ecosystems. In addition, exchanges across and processes within the land-ocean interface will be investigated. Improvements in the representation of biogeochemistry are expected from the development of high-resolution model components allowing better representation of small-scale physical dynamics. Hence the Grand Challenge project will not focus on starting many new initiatives, but rather on improving and providing important coordination and intellectual leadership to help collectively address the Grand Challenge's "Carbon Feedbacks in the Climate System" goals.